Infections with bacterium Clostridium difficile have rapidly become a significant medical problem in hospitals and long-term care facilities. The bacteria cause diarrhea and life-threatening inflammation of the colon by producing toxins that kill the endothelial cells that form the lining of the gut. Although a natural inhibitor of these toxins, called InsP6, works in the test tube, it is not very efficient when administered orally. Traditional methods to optimize InsP6 have until now not been successful, but researchers at Baylor College of Medicine have discovered that changing one atom in InsP6 can increase its ability to neutralize the toxins by 26-fold. “The toxins, called TcdA and TcdB, are very large molecules that kill the cells very efficiently,” said Dr. Tor Savidge, associate professor of pathology and immunology and of pediatrics, director of the Savidge Lab at the Texas Children’s Microbiome Center and senior author of the paper. “It’s like delivering a warhead into the cell. The toxins bind to the cell and the cell internalizes them in a sack of cell membrane called endosome. Not all of the toxin will exit this sack to kill the cell, just the little warhead pokes its head out. Another section of the toxin senses when the warhead is outside the sack and cleaves it. The warhead is released, interferes with basic functions and kills the cell,” said Savidge. To neutralize the toxins, the researchers targeted the section that senses when the warhead is inside the cell, called allosteric modulator. “The strategy we have tried is to make the toxin ‘think,’ before it binds to and enters the cell, that the warhead is ready to be released, so it releases it prematurely,” said Savidge. When the warhead is released outside the cell, it is neutralized. InsP6, the toxins’ natural inhibitor, works this way, but is not very efficient. Finding molecules that would bind to the allosteric modulator and trigger the premature release of the warhead involved analyzing and testing half a million molecules listed in large databases. Dr. Numan Oezguen, a member of the Savidge Lab, used virtual drug screening to sift through the databases to identify candidate molecules that most likely would bind to the allosteric modulator. One of his screening strategies consists of creating virtual 3-D structures of the molecules, projecting them on a large screen and using 3-D glasses to determine the most likely interactions between molecules. The molecules whose virtual analysis suggested they would bind to the allosteric modulator were then tested in the lab. “Before we considered the role of water, the predominant idea was that to strengthen the interaction between molecules the ability to form hydrogen bonds had to be made as strong as possible in the drug. It turns out this is not the case,” said Oezguen. Many times drugs designed to be able to make strong hydrogen bonds bind poorly to their targets. The researchers discovered that to enhance the binding of a drug to its target, both sides of the hydrogen bond, the side on the drug and the one on the target, have to have either significantly stronger or significantly weaker hydrogen bonding capabilities. On the other hand, a mixed strong-weak hydrogen bond pairing decreases the overall binding of the drug to its target, in some cases by 3 million fold. The decrease in binding is the result, the researchers propose, of water molecules forming hydrogen bonds with the drug and its target, therefore preventing the drug and the target from forming hydrogen bonds between them. This entry was posted in C. diff. Research & Development, C. diff. Research Community and tagged allosteric modulator, Baylor College of Medicine, C diff research and developnent, C difficile research and development, C difficile toxins, Clostrideum difficile, Colin Ferguson Echelon Biosciences, Deliang Chen Gannan Normal University China, Dr Numan Oezguen, Dr Tor Savidge, hydrogen bonding, InsP6, IP6, Petri Uryl Baylor, Sara Dann University of Texas Medical, Savidge Lab, Texas Children's Microbiome Center on March 29, 2016 by cdifffoundation. The European Spores Conference (ESC) has rapidly become one of the leading ‘focused’ microbiology conferences with a reputation for outstanding speakers, a beautiful venue and excellent social events. The ESC provides the only worldwide forum for scientists with an interest in spore-forming microbes and now attracts participants (academic and industry) from across the globe. The conference has followed earlier meetings in Slovakia and Italy and with the last two being held at Royal Holloway, University of London in April 2012 and April 2014. The 7th ESC is once again sponsored by FEMS who have generously provided grants for early stage researchers. Following the 2014 conference, a selection of presentations were published in a special spores-themed issue of FEMS Microbiology Letters. Oral presentations will be chosen from abstracts submitted before 19th February 2016. Those interested in giving an oral presentation should send an abstract as soon as possible to s.cutting@rhul.ac.uk Registration is not necessary for abstract submission and can be completed later. This entry was posted in C. diff. for Healthcare Providers, C. diff. Research & Development, C. diff. Research Community, Raising C Diff Awareness Education and tagged 7th European Spores Conference, Anthony Wilkinson University of York, bacillus, Bioremediation, Biosensors, C diff conferences, C diff Spores Related Conference, C difficile Conferences, Clostrideum difficile, Daniel Paredes-Sabia, Kumaran Ramamurthi, Lee Kroos, Michigan State University, New York University, Patrick Eichenberger, Peter Setlow, Professor Simon M. Cutting, Royal Holloway, Sarah Kuehne University of Nottingham, Shonna McBride Emory University, Spore Structure and Function, UK, University of Connecticut Health Center, University of London on February 18, 2016 by cdifffoundation. AccessDIFICID is a support program for patients who have been prescribed DIFICID® (fidaxomicin) tablets. After your intake form has been processed, you will receive a phone call from an AccessDIFICID case manager, who will work with you throughout the process. You may also contact a case manager at 1-844-282-4782 (M-F, 8 am – 8 pm; SAT, 9 am – 1 pm, ET). This entry was posted in C diff Treatments and tagged AccessDificid Patient Program, c diff treatment, C. difficile patient information, Clostrideum difficile, Clostridium difficile treatment, Dificid, fidaxomicin, Healthcare, Merck on January 27, 2016 by cdifffoundation. Synthetic Biologics, Inc.. a developer of pathogen-specific therapies for serious infections and diseases, with a focus on protecting the microbiome, announced on March 30, 2015, the initiation of a Phase 2a clinical trial to evaluate the gastrointestinal (GI) antibiotic-degrading effects and the safety of SYN-004, the Company’s investigational oral beta-lactamase enzyme designed to protect the microbiome and prevent C. difficile infection (CDI). C. difficile is the leading type of hospital acquired infection and is frequently associated with intravenous (IV) antibiotic treatment. Beta-lactam antibiotics are a mainstay in hospital infection management, and include commonly used penicillin and cephalosporin antibiotics, such as ceftriaxone. The U.S. Centers for Disease Control and Prevention (CDC) has categorized C. difficile as an “urgent public health threat,” and has stated the need for research to better understand the role of normal gut bacteria. SYN-004 is intended to block the unintended harmful effects of antibiotics within the GI tract and maintain the natural balance of the gut microbiome, potentially preventing the 1.1 million C. difficile infections and 30,000 C. difficile-related deaths in the United States each year. During 2012, approximately 14 million U.S. patients received approximately 118 million doses of IV beta-lactam antibiotics that could be inactivated in the GI tract by SYN-004. The Phase 2a randomized, multi-center, open-label study is expected to evaluate the ability of two different dose strengths of SYN-004 to degrade residual IV ceftriaxone in the GI tract of up to 20 healthy participants with functioning ileostomies, without affecting the concentrations of IV ceftriaxone in the bloodstream. The study consists of two treatment phases for all participants: 1) the administration of IV ceftriaxone alone, and 2) the administration of one of two doses of oral SYN-004 and IV ceftriaxone. Chyme samples will be collected from the participants to measure the ability of SYN-004 to degrade the residual antibiotic. Participants will be enrolled at up to four trial sites located in the United States and Canada. This entry was posted in C. diff. Research Community, Clinical Trials and tagged C Diff Clinical Trials, C. diff. prevention, Cdiff synthetic biologics, Clostrideum difficile, Healthcare, Microbiome, SYN-004, Synthetic Biologics SYN-004 on March 30, 2015 by cdifffoundation. Do you have questions about a C. diff. infection? 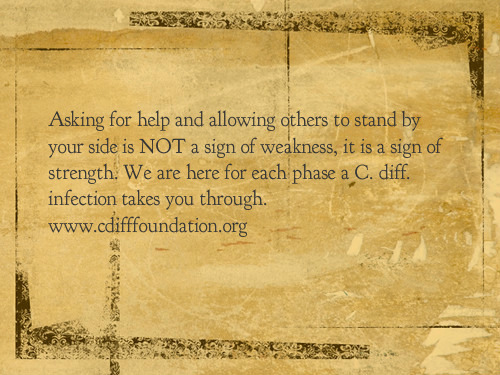 And speak with a information specialist for assistance regarding C. diff. infection prevention, treatments, and environmental safety products available. This entry was posted in C. diff. prevention, Support and tagged Bleach, c difficile cleaning, C. diff. spores and more, Cdiff education, Clostrideum difficile, Germicidal, Healthcare, Healthcare Education, Healthcare Professionals, Home care, Patient safety, Spores on March 10, 2015 by cdifffoundation.